SILVERCEL Antimicrobial Alginate Dressing - 4 1/4" x 4 1/4"
Silvercel Antimicrobial Alginate Dressing - 2 x 2"
SILVERCEL Antimicrobial Alginate Dressing provides the broad-spectrum antimicrobial action of silver with enhanced exudate management properties of alginate technology. The Sivercel Alginate Dressing comes in a 4 1/4" x 4 1/4" square pad. 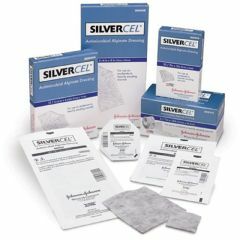 Use SILVERCEL as a primary dressing. Alginate forms a gel on contact with exudate. Cover with a non-occlusive secondary dressing. Do not use Alginate on third-degree burns or with patients with known sensitivity to silver or alginates. Long Term Use. Keep In The Medicine Cabinet. I had a chronic sore on an old birthmark that kept bleeding and wouldn't heal. My dermatologist recommended Silvercel; while it took awhile, it worked beautifully. It even works to clot blood on a new sore - I'm taking Plavix, so have trouble with excessive bleeding if I get a cut or sore. This product helped staunch bleeding and clot into a scar, which then closed. As long as not allergic. Safe. Easy To Use. Have heard the benefits of using silver impregnated products as an antibacterial. Just following what the doctor has tried in combination with Promogran Prisma, have seen results in the last 3 weeks not sure if it is the Silvercel or Promogran. Also relieving pressure from the area I'm sure is helpful. Quick Fix. Long Term Use. Keep In The Medicine Cabinet. Easy To Use. Effective. Safe. Promotes Healing. Long Term Use. Keep In The Medicine Cabinet. Quick Fix. Works well on open sores.